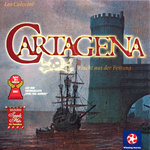 Cartagena takes as its theme the famous 1672 pirate-led jailbreak from the fortress of Cartagena. Each player has a group of six pirates and the objective is to have all six escape through the tortuous underground passage that connects the fortress to the port, where a sloop is waiting for them. Each card bears one of six symbols (dagger, pirate hat, etc. ), and you move a pirate forward by playing a card and moving ahead to the matching symbol in the tunnel, leapfrogging over those where another pirate already stands, but the only way to get more cards is to move backwards. This turns into a simple but smart game of patience and opportunity, well received by casual gamers.